Did you know that at one time, the natural gas industry was under monopolistic control? Let’s take a look back at how it evolved toward “common carrier status” and how that has encouraged competition and growth in the natural gas market. What Is "Common Carrier Status? And How Does it Relate to Nat Gas? The idea of common carrier status is that a company can own a pipeline and oversee transportation. But it can’t ALSO be the owner of the product flowing on the pipeline or the ultimate buyer of the product. In other words, the company owns the hardware and keeps tabs on the process but doesn’t own the product. Additionally, such a company cannot exclude others from buying pipeline space. In other words, a company can’t cherry pick who gets to use the pipeline. The natural gas market is not completely common carrier (more on that some other time). But it’s darned close. To find out how we arrived at this very specific relationship, we need to take a trip back through history. The concept of common carrier status got its start in the oil and gas industry in the early 1900s, but it took nearly 60 years and a series of regulations to put it to work for the natural gas industry. In the late 1800s and early 1900s, monopolistic companies were able to control each segment of the natural gas industry: production, transmission and distribution. By the late 1920s, there were only 11 holding companies in the U.S. controlling about 75% of the existing 50,000 miles of natural gas pipelines. The federal government soon took notice that the 11 companies were dictating the industry, during a period in the early 1900s characterized by the development of antitrust laws in the U.S. The Federal Trade Commission (FTC) had been established to protect consumers across all industries and by 1935 the agency zeroed in on the transportation side of the natural gas industry. Its conclusion was there was too much market power and a common carrier status was needed to offset it. Over the next 60 years, a series of regulations and orders were passed in order to determine how to best deregulate the gas industry while, at the same time, protecting the public against monopoly power. An original attempt to curb monopoly power was the 1938 Natural Gas Act, in which the Federal Power Commission (FPC) was given the power to set the rate that producers could sell gas into an interstate pipeline. The pipeline would then transmit that gas, along with its own gas, to the city gate. And then at the city gate, gas would be sold to the local distribution company. That price would also be set by the FPC. But this act did not create a fully competitive structure. It was the deregulation of the industry in the 1980s and the 1992 Federal Energy Regulatory Commission Order 636 that increased competition in the natural gas market and finally provided the regulatory framework for near-common-carrier status. Due to FERC Order No. 636, interstate pipelines must separate their transport business natural gas from their sales business; one entity can’t move and own the gas. The order was the zenith of the prior century’s worth of moves toward deregulation and set the stage for how the industry is organized today. Market participants can move gas as price opportunities are presented. The concept of common carrier has had a long and winding history. State and federal natural gas regulations have circled around many components of the idea over the last century with the aim to protect competition in the industry. Its history helps us appreciate why regulations are dynamic and have shifted over time to create an environment in which sellers of natural gas don’t have competitive advantages, but rather operate in a market-based environment, in which prices are the result of supply and demand dynamics. And these regulations have given rise to the need for transparency on prices and gas flow dynamics. 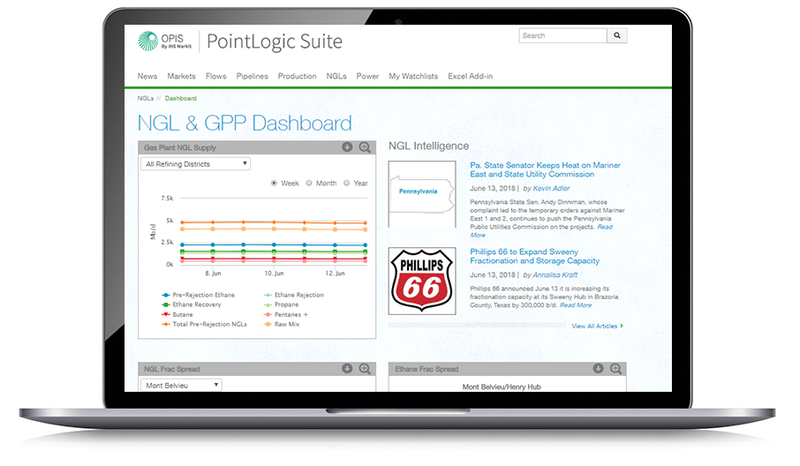 OPIS PointLogic – from OPIS by IHS Markit – is a software suite of specialized, interactive modules and reports to help you make faster, more profitable decisions.